To say this is an affecting film would be an understatement, because if you want, to be honest, it is truly heart wrenching and painful to watch. From the beginning moments, this film brought to mind a modern-day hybrid of The 400 Blows with a bit of The Bicycle Thief mixed in. However, comparisons are always unfair, because this film will never be either of those and that is fine. 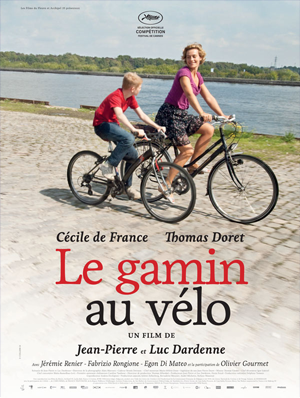 Cyril (Thomas Doret) is a young red-headed boy whose most prize possession is his bicycle. Now his mother is non-existent (either dead or gone) and his father might as well be. The boy lives at a foster home, but he is an unruly occupant who is prone to flee. The reason being is that Cyril clings to the hope that his father will come and get him or that his father will call him soon. It never happens. On one such escape attempt, Cyril clings to a lady hairdresser (Cecile de France) as his caretakers pry him away. Soon she comes to see him and brings his prized bike which had been stolen. Next, she graciously agrees to take him for the weekends after he asks her. However, he is far from a perfect child, often detached, prone to disobey, and can even be violent at times. Things get worse when Cyril goes with Samantha to talk to his father. It’s a happy moment for Cyril until his father reluctantly tells him to his face that he will not take him back. He had initially asked Samantha to do it showing his lack of a spine and self-respect. You cannot much blame Cyril, but he gets worse before he gets better. He spends time with a local thug who ingratiates himself to Cyril with bike repairs, Assassins Creed, and soda. The motive being he needs a new accomplice to take part in a small-time robbery. The worst part is Cyril does it after Samantha specifically tells him not to hang out with the guy. Without getting into all the gory details Cyril runs into more problems, Samantha gives up her boyfriend, and there are more repercussions for his actions. However, unlike The 400 Blows, this film ends on perhaps a more positive, although altogether odd, note. We can only hope that Cyril and Samantha gel even more because they deserve to be happy, but that is a story for another film. Or maybe it is better not knowing. I had yet to see anything from the Dardenne Brothers, but I can see why their type of film-making is so popular. It’s “European film” at its best with simple storylines, realistic and humble camerawork that is brought to life by complex characters. There is a lot of raw emotion and character traits that must be parsed through. Motives and actions must always be questioned since we cannot understand everything. We just know they happen. That is a beautiful thing I suppose because these characters are not often two dimensional and that is a service to the audience. These are the type of films people deserve to watch whether they know it or not. If all we see are summer blockbusters and Oscar contenders we would be missing out on a whole different niche of film entirely. Give it a chance and just maybe you’ll like it. This entry was posted in 2010s, Drama, French and tagged Dardenne Brothers, Foreign Film, Great Film, Review, The 400 Blows, The Bicycle Thief by 4StarFilmFan. Bookmark the permalink.